Shukugawara Elementary School is a large urban school with about 700 students. This school is special because my wife Noriko and I know one of the fourth-grade students, Kyoko Sekiyama. 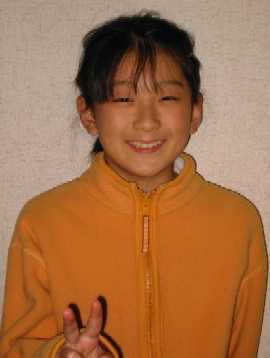 For the last couple of years I have exchanged letters with Kyoko and her sister Reika, who is now in the seventh grade. This year for my birthday the Sekiyama family gave me a cute beagle T-shirt. During my November trip to Japan I visited two Japanese kindergartens, and the children there enjoyed very much seeing the gentle-looking dog on the front of my shirt. This June my wife accompanied Allison Shefcyk, a high school sophomore in Connecticut, on a one-week trip to Japan. This was Allison's first trip to Japan, and although she enjoyed visiting the famous tourist sites in Osaka and Kyoto, I hear that the manga (comic book) shops seemed to excite her the most since she is a big fan of Japanese anime (animated cartoons). This love of anime first sparked her interest to begin studying the Japanese language since she was disappointed in the quality of some of the dialogue that had been translated into English. She thought she would be able to appreciate the anime much more if she could understand the originals in Japanese. 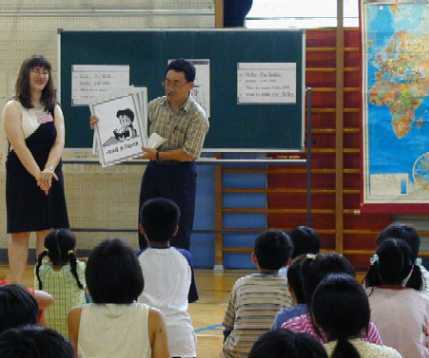 During Allison's first visit to Japan, she had the opportunity to visit several classes at Shukugawara Elementary School. She had fun teaching English phrases and words to students. Early next year Shukugawara Elementary School will receive a new Blue-eyed Doll from Mr. Sidney Gulick, 3d, and his wife Frances. Since 1986 the couple has sent approximately ten dolls each year to schools in Japan. Frances Gulick makes traveling clothes, a nightgown, and a handbag for each doll. Her husband prepares the passport and a letter of introduction. These dolls are sent to Japanese schools to help the children of the two countries better understand and appreciate each other. My wife and I plan to attend the ceremony to present to the doll to Shukugawara Elementary. In the morning Kyoko's mother accompanied me to the school, and we talked briefly with the principal. Next I went to speak to each of the sixth-grade classes and to Kyoko's fourth-grade class. I showed the students many photos from Allison about her family and her hometown of West Hartford, Connecticut. Although Allison had visited the school in June, the students remembered her very well. Also, since the Japanese school year runs from April to March, the students were in the same classes both now and when Allison visited. The children were amazed to see the super size cup from McDonald's in America, since the McDonald's restaurants in Japan do not have such huge containers for drinks. One boy seemed extremely happy when I said he could keep the cup. Shukugawara seemed to be the most international school of the 13 Japanese schools I visited in November. I met students whose parents are from the US, the Philippines, and Colombia. The sixth-grade boy from Colombia had a smile on his face when I spoke with him for a short time in Spanish during my presentation to the class. He seemed surprised to find out I had worked in Colombia and still enjoy listening to music by singers from Colombia. I ate lunch with Kyoko's fourth-grade class, and after lunch the students cleaned the school building. 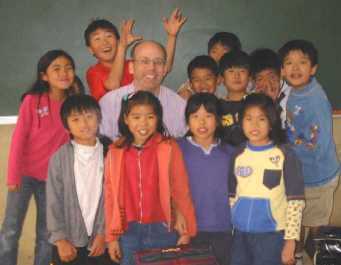 When I was about ready to leave, I was very surprised to receive a book of one-page letters written by the students in the sixth-grade class of Mr. Fujita. The students gave their opinions about our time together, and they also gave their impressions of America. Many students let me know their favorite sport, pet, or hobby. I look forward to visiting Shukugawara again next year when the school will receive a new Blue-eyed Doll from America.